A table could be made of many materials like metal, wood glass etc. whatsoever is used in making the table, one thing is pretty established that a table is the need of each house, commercial site, offices restaurants whatever it is. They are a great supportive furniture item, we use it for multiple purposes. But what exactly do you conceive from a picnic table? Well, this should be holding a couple of features that make it a perfect table for picnic. Like it should be a bit lighter in weight, it should be much spacious than the usual ones, and it must be stained with some attractive colors just to add more fun to the site. I think this one is great to get started with. 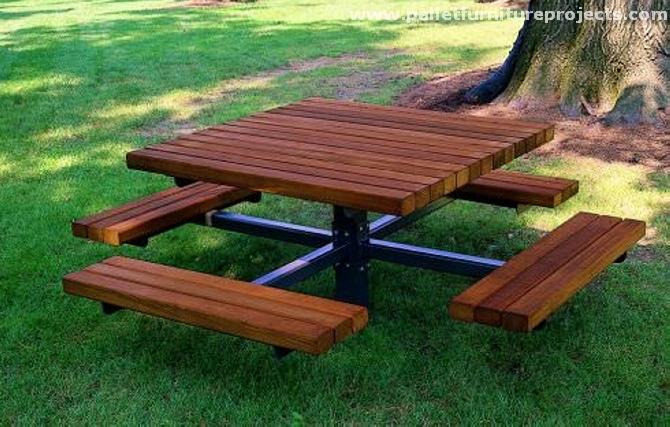 This is an idea kids picnic table, what exactly makes it to be so special is its specific design and structure. 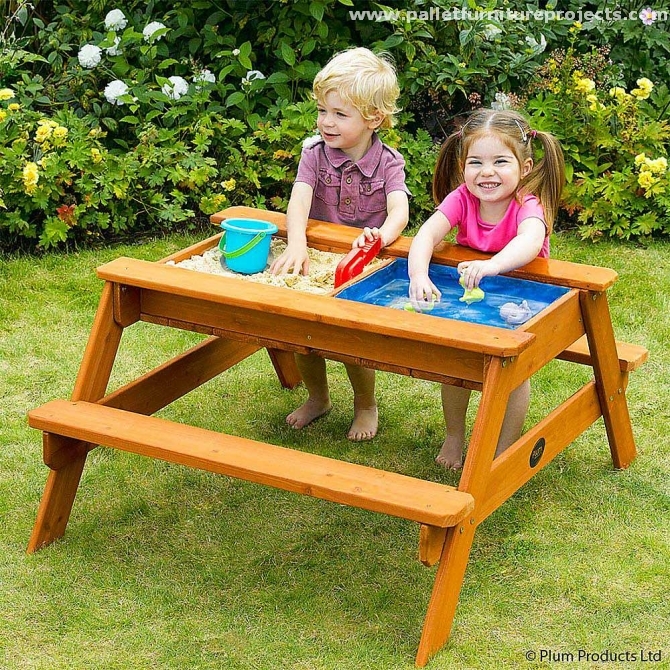 It is made in such a way that you need nothing else when you have this picnic table for sitting. Do you remember going to kids theme park in the childhood? This sort of furniture is installed in such well established theme parks where a lot of money is spent especially for the kids. So the idea is borrowed from there basically. I have always been of the view that this is the prime need of kids to play in some outdoor areas in sand, apparently this might look like some nasty stuff, but this actually adds a lot in the character building of the kids. 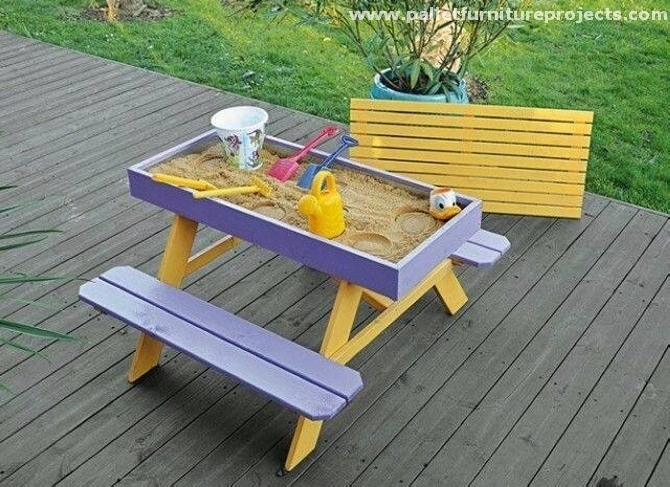 So how about this colorful picnic table along with the sandbox. Just have a look on this one, isn’t it simply cute? I don’t know what exactly is so damn appealing in this great project, this might be the stones, or the metallic cage that is designed for them as the table base or anything, but the project overall is simply great. Now this is again something perfect for the school going kids. 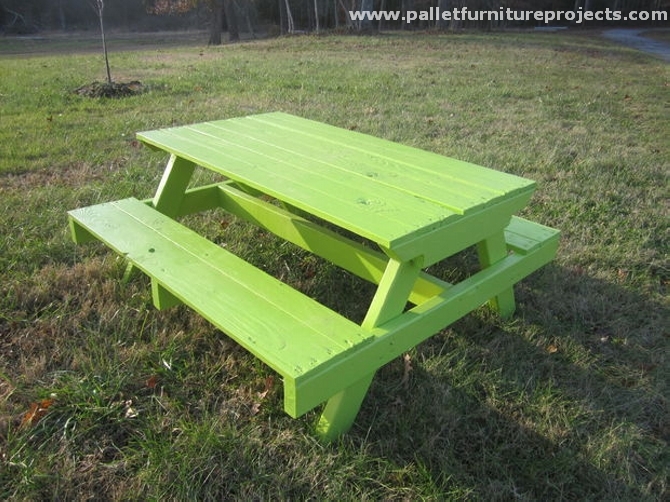 Having this pallet wood recycled table, they would be having the same school atmosphere right at their home. Colored seats and a shade on the top would prevent them from sunshine. 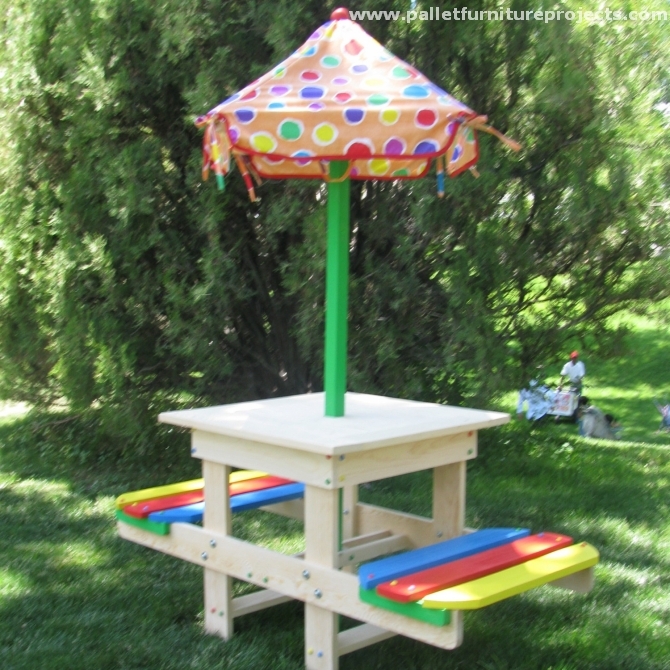 I am simply convinced from the ideas presented here, this is another splendid picnic table for the kids. Rather I would like to call it a mini play land. This is so smartly equipped with all the necessary things like it has got a mini sandbox, a mini pool for the ducks, and built in benches, so a complete package eventually. Now here’s something that adults need to look upon, this is something more than a mere wooden table. This is a blend of luxury, style and enthusiasm. It has got a netting swing that would keep you swinging and cheering all along. And here comes something grand. 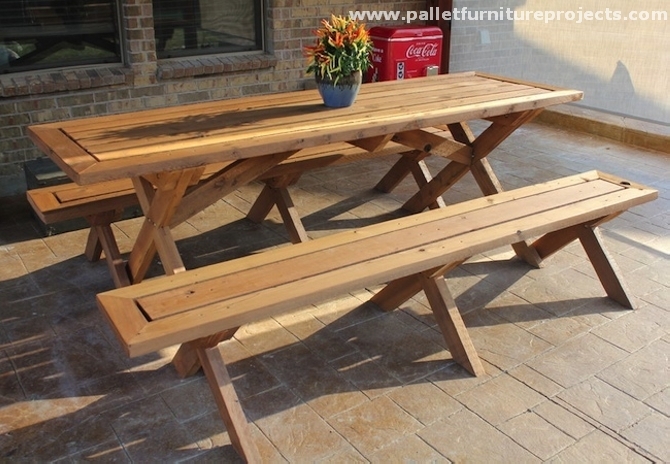 We can see here a proper long two piece wooden pallet recycled table, along with four unit wooden benches. This is a comprehensive sitting space for the family to spend some quality time in the patio or garden. 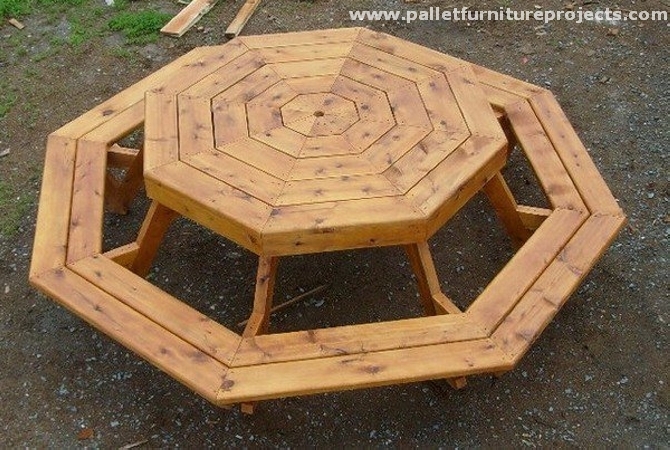 Another great picnic table inspiration comes your ways, it is again sort of furniture that lacks nothing. 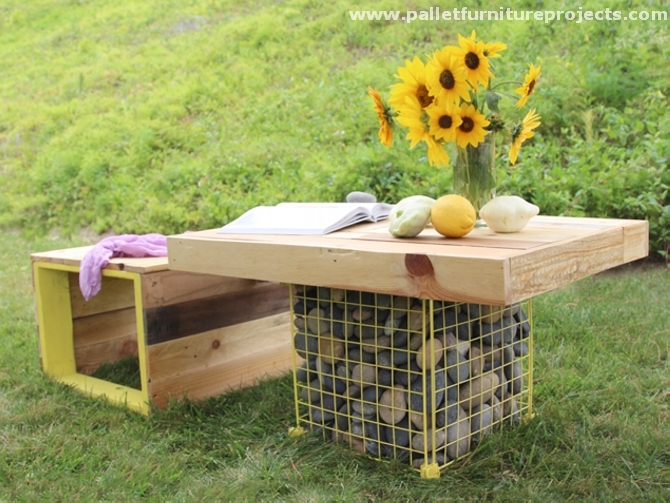 It has got it all, style, fashion and luxury combined in one single wood pallet recycled table. 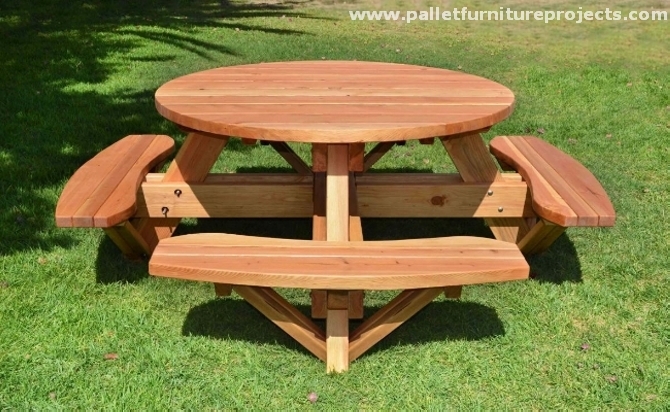 This makes it a perfect wooden furniture item for you garden and patio as well. This project is slightly similar to the last one in design and shape. Made with some of the freshest pallet wood planks, it is very well sanded and then stained in light green color to make it look like a perfect garden stuff. The whole family can enjoy some quality time sitting on it. We just couldn’t forget some rustic wooden item so we thought to bring this one in the collection. Made with some thick wooden pallet planks, and they are fixed with some robust nut bolts. That makes it pretty strong to carry the heavier weights. 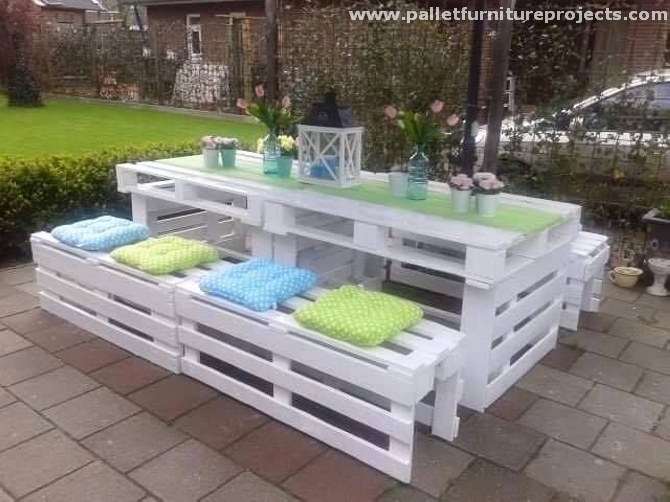 What would you say about this great pallet wood creation? Seems like a portion of a round table I split up and pulled up, but actually this is all about the skill of carpenter that actually made this possible. 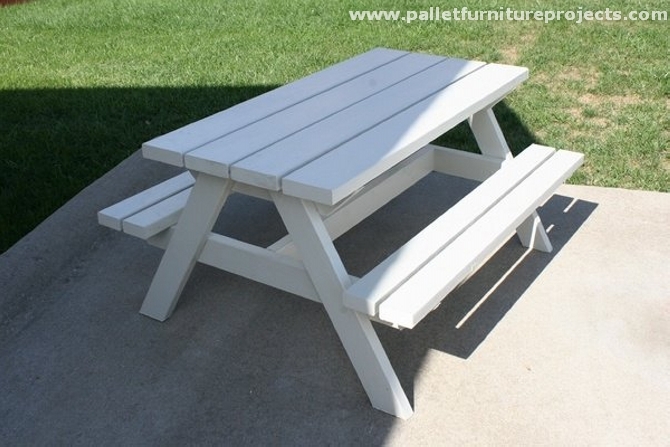 The split up inner portion is a great picnic table while the rest could be used as wooden benches. When you are planning to recycle something for your patio or garden, this has to be quite compatible with that place like it has to be big, it has to be luxurious, and also cost effective. 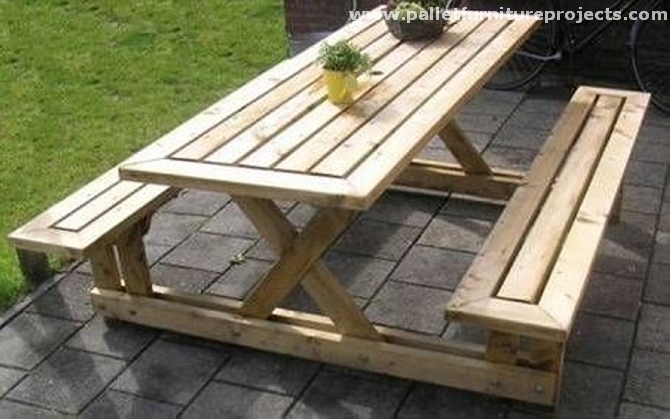 All the qualities could be observed in this picnic table. 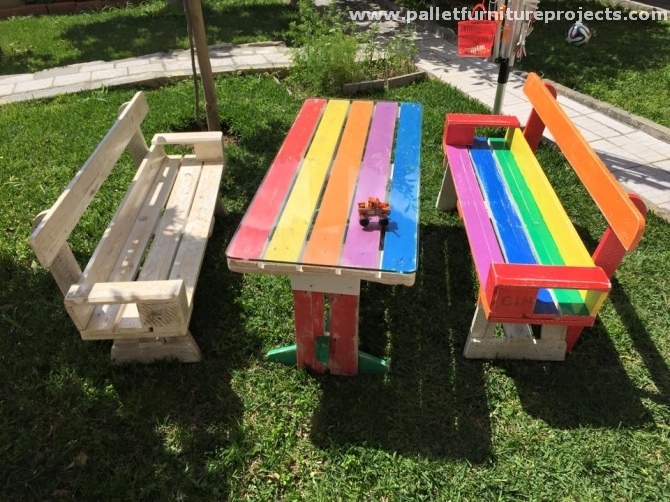 We are just making some minor amendments in the basic designs and structure and we are successfully yielding these splendid wooden pallet recycled picnic tables. 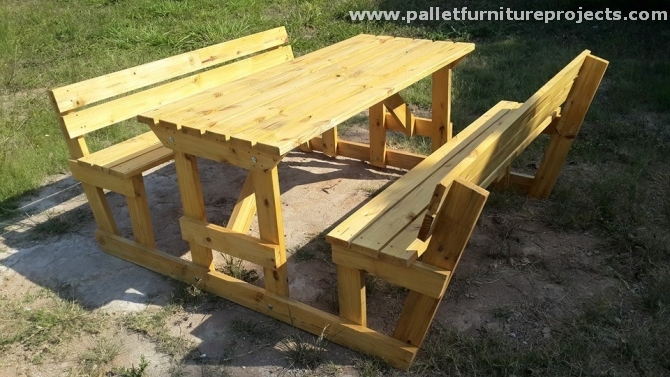 Again some fresh shipping pallets were used for this outdoor picnic table and it turned out to be a flawless furniture item that would definitely create a difference. A picnic table is supposed to be fully equipped with all the seating necessities, and I strongly believe that we are going pretty accordingly so far. 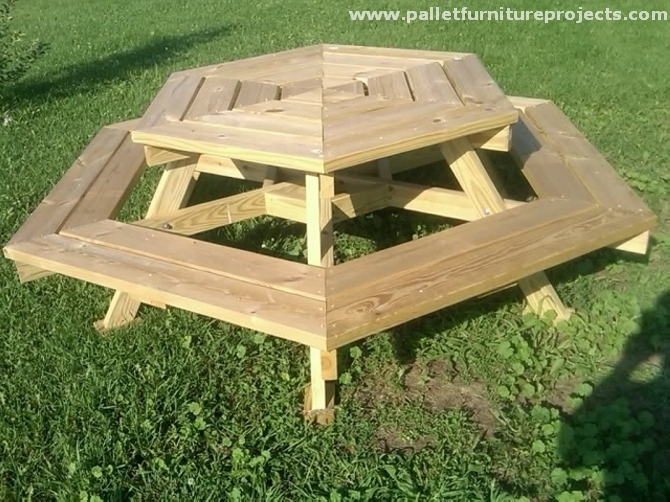 All of these wooden pallet picnic table inspirations are quite practical, they can be repurposed using some basic wood work techniques. If you want to keep your kids inside the house and you don’t want them to go outside because you are concerned with their safety, create such an atmosphere for them right at home that would compel them to stay home. 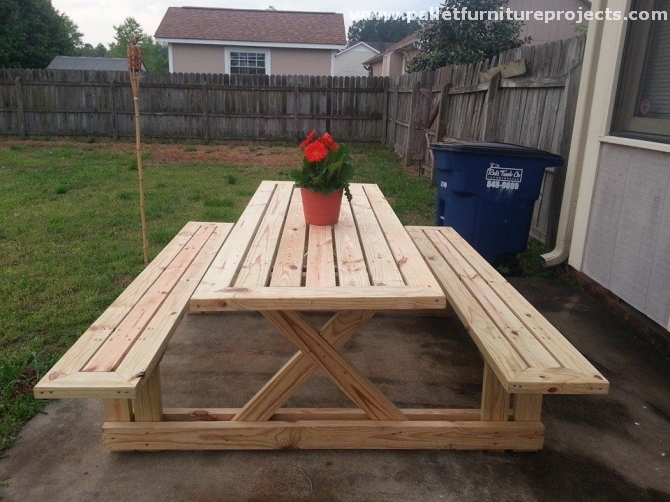 And I think this pallet wood picnic table would do the best job. 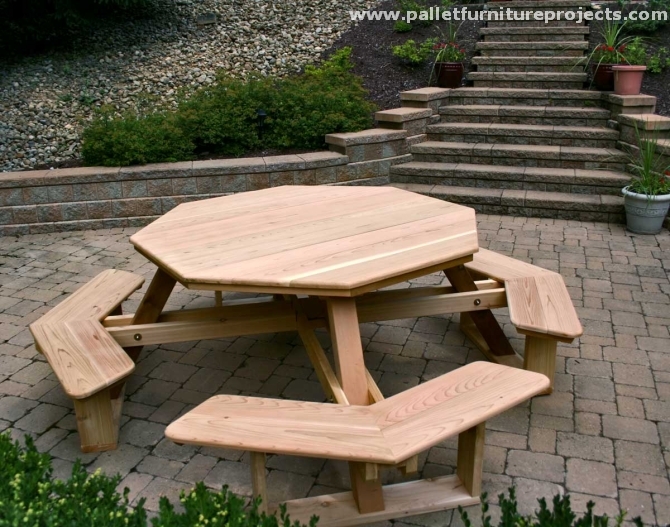 I am really loving this unique pallet wood picnic table, this is a bit unique in design and nature. 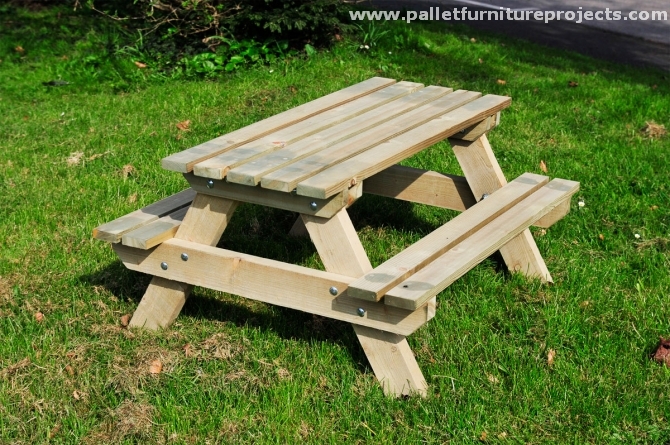 So apparently just another great addition in the range of wood pallet picnic tables. You can use it for some evening coffee or a simple chatter in casual atmosphere. And at the end we just wanted to finish off the article with some landmark wood pallet creation. This one lacks nothing simply, this is complete definition of decency, delicacy and sophistication. 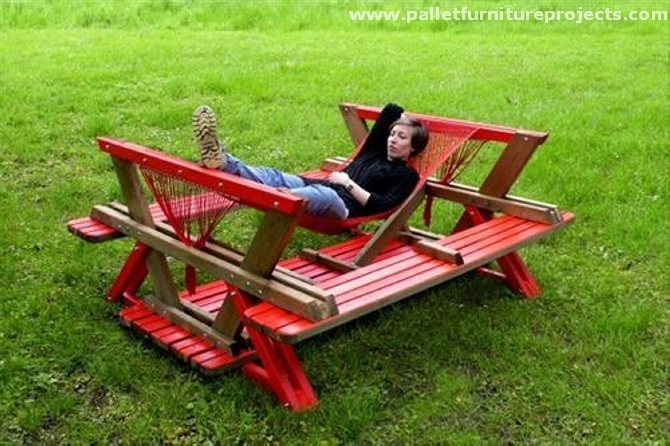 This would make your patio an ideal place to sit, you must give it a try if you are a true art crafter.